Posted on Friday, December 4th, 2009 at 5:42 am. Description: Dawen’s “American Me” Fall Tour continues with stops in Los Angeles, New York, and Hong Kong. Hey New Yorkers! 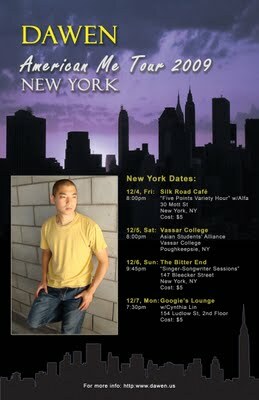 Dawen will be playing four shows in New York from December 4-7 before heading to his next stop in Hong Kong. Dawen will be performing his special solo/acoustic set of songs off his just released debut album “American Me” along with a few special covers. And as if that wasn’t enough, Kollaboration Acoustic 3 winner Alfa will be making a guest appearance. But wait, there’s more! Taiwanese American sensation Cynthia Lin will be performing with Dawen at his last stop in New York on Monday. You don’t want to miss it!